The former lead singer of British rock band The Kinks treated a gathering of tourists, fans and journalists to a rendition of one of the band's hits, earlier today, on the riverside next to the Royal National Theatre and Waterloo Bridge in London. 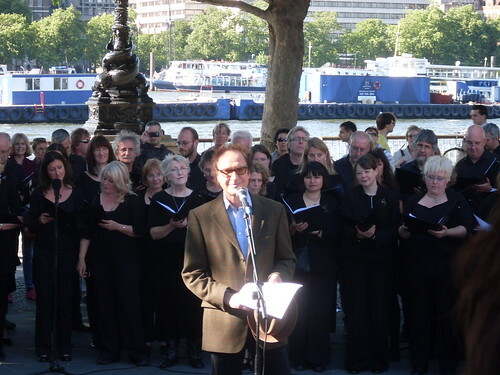 Bathed in the setting sun, Ray Davies, backed by singers of the Crouch End Festival Chorus, performed the bitter sweet ballad Waterloo Sunset. The event was in advance of the release of Davies' new album, The Kinks Choral Collection, to be released next week and on which the Crouch End Festival Chorus is also taking part. The 1967 song, which reached number two in the charts, appeared in the album Something Else by The Kinks and was composed by Davies who performed it twice tonight to the delight of his fans. The lyrics are from the point of view of a solitary man on the south bank of the Thames watching (or imagining) the romantic encounters of a couple at Waterloo Underground, then crossing Waterloo Bridge. Davies, in his 1996 autobiography X-Ray, says the inspiration for the song came from an incident when he was hospitalized as a boy. On the BBC radio show The Davies Diaries, Davies stated that "I can't tell you who they are because they're good friends of mine". In a 2008 interview with Spinner Magazine, Davies stated "it was a fantasy about my sister going off with her boyfriend to a new world and they were going to emigrate and go to another country." A new arrangement for See my Friends (first released in 1965) which will appear in the new album was premiered tonight by the choir on its own at first and then performed by Davies and the choir. For me this was an interesting event for several reasons. First, I know a member of the Chorus but more importantly perhaps, Waterloo Sunset is part of the current repertoire of my own choir. As a coincidence, we will be singing it on Friday evening (7 and 8pm) at the Scoop (the amphitheatre attached to City Hall) only a few hundred metres down river form the location of tonight's event. More pictures of the event are available on my flickr account here. What's the Point of Jobcentre?